How I Plan To Win the Election! In the 2010 election for Congress, the press asked me to comment on how I planned to win the primary election against well financed opponents Paul Kanjorski and Corey O'Brien. I recognized that the road was uphill I had confidence that the people are looking for honest government and a fresh start. I knew I represented both. "In fact, for the poor job they did, it would be great if all 435 representatives were replaced. But, it all starts at home." "In fact, for the poor job they did, it would be great if all 100 Senators were replaced, but since only about 33 of them run every two years, let's see if we can replace 34 this time. But, it all starts at home." Back in 2010, to help answer the media inquiry on how my under $5,000 self financed campaign could be successful, I wrote a response to answer that question. The full text is included below. From the next paragraph forward, these were all press quotable points from then House candidate Kelly. In this response I explain how I planned to get my message out, why I expected that my message would be heard, and why I expected to win without accepting any contributions. 'You'll have to ask Lou about Reservations." "I am hoping to get my message out through news articles such as the one you are reading, engaging in talk radio, and making myself available for speaking engagements and debates. My web site www.briankellyforcongress.com is a storehouse of information on all the issues and I am already getting a lot of hits. My campaign signs are appearing hither and yon in all five counties, and so I expect even more Web traffic soon. Before too long, there will be a buzz in the barber and beauty shops, in the cafe's and the supermarkets, and we all know that word of mouth is the strongest advertising. "I realize that I am technically at a disadvantage in getting elected by not being able to spend tens of thousands of dollars or more of other people's money trying to become known. But, the people are smart enough to know that I will owe nobody. The machine does not have even a little piece of Brian Kelly. My being in the race may make it a little more difficult for the voters to be aware of all of their choices since I cannot push my message out as the others can. But when elected, it will be a big plus for voters because I will represent them and not the special interests who paid for the others' big campaigns. "Paul Kanjorski is a powerful guy in Congress, without a doubt. Perhaps he is too powerful for Northeastern PA. He is senior member of the Financial Services Committee. He is also the Chairman of the Financial Services Subcommittee on Capital Markets, Insurance and Government Sponsored Enterprises. This committee has jurisdiction over securities, exchanges, and insurance matters. In other words, through these two committees, Mr. Kanjorski has a lot of power over Wall Street. Have there been any problems with Wall St. and the financial markets recently? Should Mr. Kanjorski have helped in their resoultion? Wall Street likes Paul Kanjorski and if you or I were them, we too would be donating to the Kanjorski campaign. "The people of Northeastern PA know that Paul Kanjorski was instrumental in the bailouts, the excessive spending, the deficits and the debt. He cannot run away from it. It was on his watch that the financial industries collapsed and many people in Northeastern PA lost huge chunks of their retirement funds. Why would anybody send him back to cause more harm to the American people. "Mr. Kanjorski is also a ranking member of the Committee on Oversight and Government Reform. What oversight? What reform? As a University professor, it is clear to me that his work in the past several years has been below sub-par, and for his efforts, Mr. Kanjorski deserves an "F" grade from the people. He failed all of us. All of these financial problems occurred while Mr. Kanjorski carried titles indicating that he should have had a major roll in preventing the collapse of the financial industry. .
"Paul Kanjorski reportedly has taken a lot of contributions from Wall Street even though his committee regulates Wall Street behavior. What is it that Wall Street expects from Paul Kanjorski if anything? I don't know the answer to that but they surely expect nothing from me. The people will know that I am not beholden to any of the Wall Street tycoons of any other industry moguls. Regular people will like that an awful lot. "I think voters are real smart and they will be even smarter this time around after the big mistake we all made in 2008. The people will have it easy in the booth this time. They will see that I am # 1 on the ballot. This is a big deal. It will be very easy to vote for me. So, once in the booth everybody will be given a chance to second guess themselves. I am betting that based on his record, the people are not going to want to send back Congressman Kanjorski and until the corruption problems in Lackawanna County are resolved, we may want to hold off on Mr. O'Brien. " "My # 1 ballot position is worth an awful lot of advertising. Ask either of my opponents how much they would be willing to pay for my # 1 ballot position if it were for sale? I would not give it up under any circumstances anyway even if it meant being able to jam the airways with great sound bites as I would expect both of my opponents are about to do. "This is the kind of time in America that will prompt the people to vote for somebody they don't know, rather than somebody they know all too well. In many ways the lack of name recognition may very well be a plus for me in this election. "I am counting on Democrat voters in Northeastern Pennsylvania to recognize that there are three candidates but many will know only two of the names as they are already well-known politicians. There is a mood of anti-incumbent and anti-politician across the country and this is just as true here in Northeastern Pennsylvania. This will help me in a big way. I have never held public office and so I am completely untainted by political corruption and that is how I like it. "Voters are looking for a real choice. If they let the office stay the same, they know they are inviting another dose of bad government -- the worst in our Country's history. The people know that instead of Paul Kanjorski listening to Paul Maher to help the people of Northeastern PA on the issues, instead, time and time again, he listened to Nancy Pelosi. Ten out of eleven times Paul Kanjorski danced the San Francisco dance with Nancy Pelosi. In so doing, he turned his back on all of us. On May 18th, it's our turn to repay the favor. "I know first hand that he stopped paying attention to we the people somewhere between his first term and his thirteenth. I have written the Congressman myself a number of times. Like many others who wrote, my message fell on deaf ears. His staff responded by sending back what appeared to be form letters. These rarely addressed my concerns. If they were on point, they informed me that I was wrong and why the Congressman knew better. I wonder how many of my letters the Congressman actually read. The bad government of the current administration is because they stopped listening to the people. Paul Kanjorski has done his service. It is time for hime to go back home and we can start that removal in the voting booth on May 18th. "People are more informed on government now than any other time in my life. Many think we already know more than the politicians. Almost everybody---from engineers to bus drivers to cafeteria workers to police officers to street cleaners to storekeepers are all talking about how bad things have gotten and how bad they are about to get. "There are surely a number who would vote for anybody other than Paul Kanjorski. I have met many of them. Maybe it is his fault. Maybe it is not. But Mr. Kanjo was the one who cast the votes against NEPA ten out of eleven times. When you cast your vote, you will be pleased that you do not have to look further than ballot position one to find an anybody who is not Paul Kanjorski. I am counting on the people to just say no to politicians and machine politics, and anybody who chooses to not listen to the people. Cast your vote for somebody ready to restore the government back to the people. May I agains suggest ballot posiiton # 1." "I may miss out on some voters who do no research and who talk to nobody but by May 18th, I think most good citizens will make a point of knowing who I am. Quite frankly, the people in NEPA are very smart, and the stakes are too high for them not to vote, and not to choose one of their own. It's time to say no to the entrenched machine politicians. By primary election day, the people will know that I am for limited government, fiscal conservancy, limited spending and for cutting taxes. More importantly, I am pro-life in more than name-only. "When they learn these messages and they choose to dig a little deeper they'll find that I also have a real solution for the Jobs! Jobs! Jobs! problem, not just a bunch of rhetoric. This government fakes right and goes left, way left, so often that the people are sick of the lies and the level of propaganda that would make Joseph Goebbels proud at its level of quality. People want straight talk and straight solutions and they know none of that ever comes from crooked politicians. "Not only are there no jobs right now, but the government is not even working on the problem. Once the  State of the Union Address was finished, neither Congress nor the Administration cared again that Americans were unemployed. While you are wondering when you are going to be able to find a job, Congress will try to convince you that things are getting much better because of their work. Yet, nobody in Congress [111th Congress] or the [Obama] Administraton is doing anything for jobs. I am not suggesting that government is the answer on jobs. Good capitalism is the answer. But, good capitalism cannot occur when the Congress favors corporations and foreign workers over American Citizens. People are smart. They see the lies. Who does the 111th Congress represent?" "While checking what my message is all about, the folks may also find that I have a unique solution for illegal immigration that can help the jobs picture. Once the word starts to spread that as a candidate, I am for real, and that my message is for real, the people will know, and the people will have their say. The Press surely has a responsibility in assuring that Brian Kelly, a regular guy running for Congress does not go into History [unelected] because the Press chose to ignore a regular guy's candidacy." "It is the people, not the machine, who are the ones who run the government, and they do that by voting. As I said in my opening, the voters of Northeastern Pennsylvania want change they can live with, and they will get that for sure when they cast their ballot for Brian Kelly in the primary. "When something needs to be replaced, whether it be a leaky faucet or a bad representative, one who has stopped representing the people, shall we agree that the sooner it is replaced, the better. Citizens of Northeastern PA, Republican and Democrat, why wait until the Fall when we can remove the incumbent on May 18th. Democrats have the power of the vote, and Republicans who love the message of Lou Barletta or this Democratic candidate, can espouse my candidacy to their Democrat friends, as this candidacy is the message of the people. "My message will get out and when it does, the people will make history. On May 18th, 2010, a candidate, whose campaign contributions and expenses are so trivial that he was not required to fill out a financial disclosure form, will have prevailed." I know that guy, And he thinks that the will of the people is about to triumph. Thank you. That was my winning message in 2010. There was one big problem. I did not win the primary. Corey O'Brien, one of my opponents blamed me for his not winning the primary. He told me that I would get just 4% and I should back out to let him win. My campaign briught in 17% of the vote because I did not have the funds to get my message out to the people. O'Brien did not offer much more than the incumbent at a time when Democrats are upset with the Democratic party. Regular Democrats are not Marxist progressives. Karl Marx was not the first Democrat. Barack Obama and Robert P. Casey Jr. have not gotten that message yet. Regular Democrats are for the people, not for a spcialist government. So, what happened? 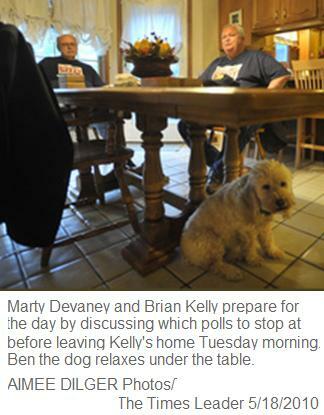 Well, as expected, the Kelly Campaign swept White Haven, after several speeches at Sitko's Barn, the top restaurant in the area, and one of the finest venues in PA., on election night, the Kelly campaign swept White Haven. My continual thanks for the people of White Haven. I was not permitted to give a speech on WVIA, Public Television because the incumbent controlled their funding, and so the people could not rely on public television to hear the candidates. Thus, it was tough getting my message out as I was as they called me, "a virtual unknown." I assure you my vote will be against the funding of public television so that it can no longer be used against the people by an incumbency that has forgotten its purpose. I was not permitted to give a speech at WBRE or any other TV station. Why? Becuase the incumbent had declared so. THe media in NEPA, other than WILK Radio, did not think that it was worth their time to give free time to any of the three candidates running for office. They did, however have no problem taking the money from my two opponents for commercial advertisements. I had no such money and the TV stations chose not to air anything I said. You'll be pleased to know that WBRE TV asked me if they could show up on election night at the venue, the Barney Inn in Wilkes-Barre, my home town, where I had chosen to gather with family and friends. I refused to tell them the location because they offered me no support during the campaign. The moral of my story is that unless you are spending huge sums with the media in NEPA or anywhere in PA, the media is not going to give you any air time. Thus, candidates like me, with a few bucks out of my own pocket, cannot get their message out to the people. Money unfortunately does control the message heard. Despite all that, thanks to the Times Leader, I did get a lot of free ink from this "press," because they chose to serve the people. It was enough for me to get 17% of the primary vote. I am a conservative Democrat. I think it is OK that I am not for Karl Marx or progressivism or Obamaninsm. I think Democrats are decent people who want what is best for their fellow man. They are not interested as a group in giving all they have to people who do not work or to illegal aliens and they are not for changing the US from capitalistic system in which the American Dream prevails to a socialistic / progressive system in which government is the god and where numbers can replace names and everybody is a nobody. So, like any self-respecting non-Marxist Democrat, I supported Lou Barletta in the fall 2010 General Election. Tons of real Democrats who were sick of the corruption went with the Republican this time around. Lou Barletta may not be sure he likes me now that he is an elected Republican but he stands for most of what I stand for on the conservative side. Because Lou is a good man, I decided not to run against him in the 2012 House election nor am I trying to find another Democrat to back against him. I plan to support Barletta again unless he disappoints us all in Congress, and i do not expect that. I see Senator Robert P. Casey Jr. as the antithesis of a good Democrat, and so, like my father would have done in his own way, I am taking him on, hoping that when elected, I will help get the right number of votes in the Senate to repeal Obamacare. A few other things have changed since 2010's Congressional election. I now know that I cannot get my message out by relying on just the Times Leader. They're good but not that good. The Citizens Voice and Scranton Times have no use for me because I am not a lap-dog Obama guy. Obama wants to destroy America. I am convinced of that as are many conservatives, who may also be Democrats. I want to keep America as the bastion of the best. I disagree with many mainstream Dems. We disagree on many issues. Republican and Democratic Pennsylvanians are on my side on these issues. I would love to meet Harry Reid as a Democrat and say "Sorry Harry!" He may not be a tuna, but worse than that, he does not appear to care too much about real Americans. So, I have decided that I am taking contributions this time around. What I learned is that no matter what the message may be, if nobody hears it, it has no impact. To keep the bigs power brokers from owning me, my fundraiser will be mostly on the Internet. Feel free to go to my contribution site to make a donation of $100.00 or less. I will do my best to serve Pennsylvania. You can be sure of that.